The Hottest Vegan Soup Recipes For you! Nothing better in winter than a warm blanket and hot vegan soup recipes. Here are plenty of wholesome and healthy soup recipes which you never will get tired of them. A huge variety of comforting vegetable soups to eat every day a different one. Totally delicious soups with unexpected additions like spices make these soups totally irresistible. They sure will keep you satisfied not only all winter long but in all times of the year. Theses vegan soup recipes are a complete meal and not just a starter. Some have delicious toppings which make them a complete meal. Recipe here>Green Kitchen Stories‘ asparagus soup switches thing up a bit. A lentil and pepita topping makes it more filling while cashew cream adds a slightly cheesy (yet vegan) taste. 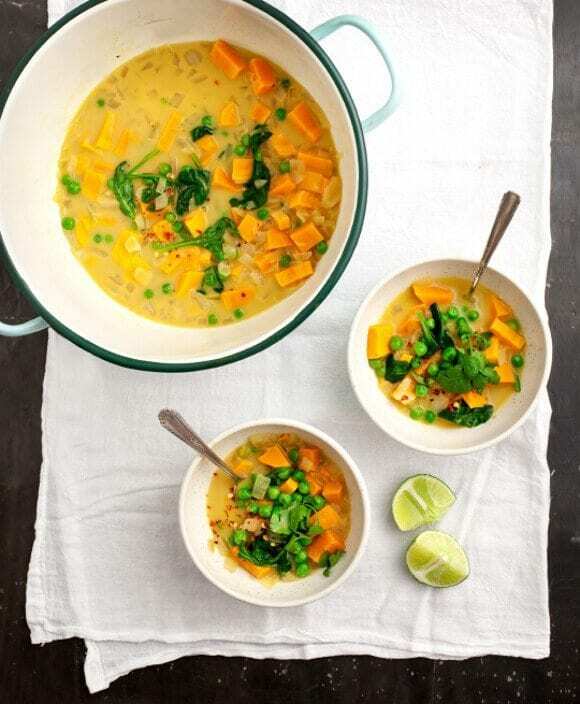 A squeeze of lime seriously enlivens Love and Lemons‘ sweet potato soup while cilantro makes a fragrant topping. Forget the burrito bowl. Oh She Glows‘ tortilla soup is full of all your favorites: peppers, tomatoes, onion, beans, and more. Add avocado on top for an extra treat. Skip the salad. Green Kitchen Stories‘ soup is packed with all the nutrients you need. Plus, tahini-dressed chickpeas make a savory topping. This wholesome soup by Averie Cooks is completely vegan, but a touch of nutritional yeast gives it a cheesy taste. Cookie and Kate knows the easiest way to get in plenty of veggies — a hearty vegetarian soup. You don’t have to give up your beloved broccoli cheese soup just to get onto the healthy bandwagon. Healthful Pursuit proves that cauliflower and almond milk can work some serious magic. This vegan soup by The Kitchn gets its creaminess from coconut milk, while fresh ginger adds an unexpected zing.